Should Your Wedding Bands Match? Short answer: it’s totally up to you. There are no rules anymore! Some couples like the idea of completely matching wedding bands. 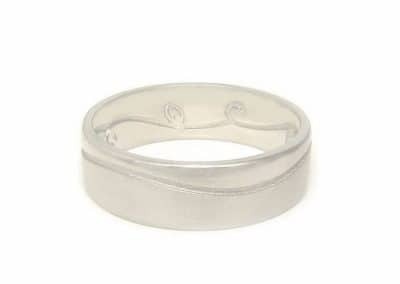 Some couples like the idea of sharing an element between the bands although they each have a unique design. And some couples decide to each go with their own unique design. So, if you’re undecided, here are a few ideas we’ve come up with to make everyone happy! There certainly is a tradition of matching wedding bands although, as we noted above, you can do whatever you like these days. 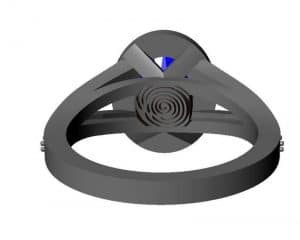 Sometimes there is already an existing engagement ring that requires a more specialized wedding ring design. 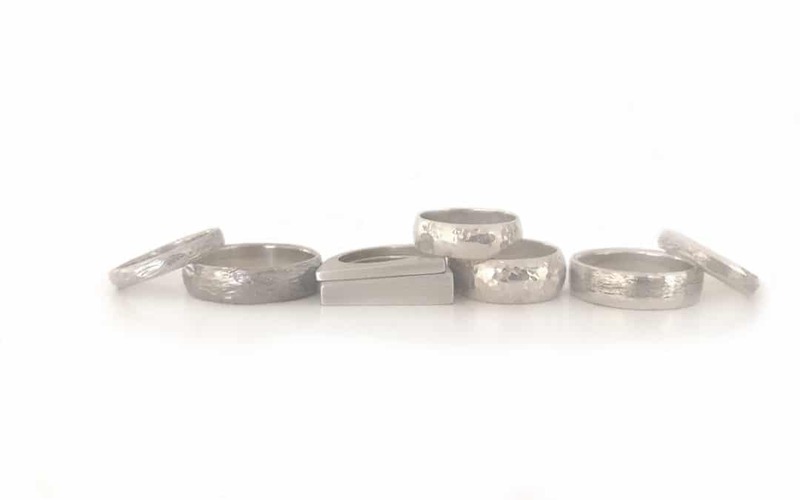 Of course, our rings are custom made so we can always accommodate a pre-existing engagement ring and take into consideration the different metal, width and thickness that may be required. 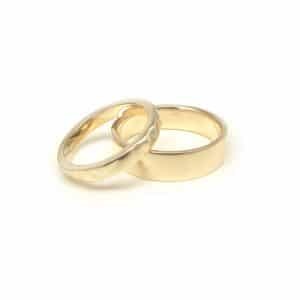 We’ve also had clients who have decided to have two wedding rings, and why not?! They have a matching wedding band that is the same as their partner’s on their right ring finger and one that goes with their engagement ring on their left ring finger. 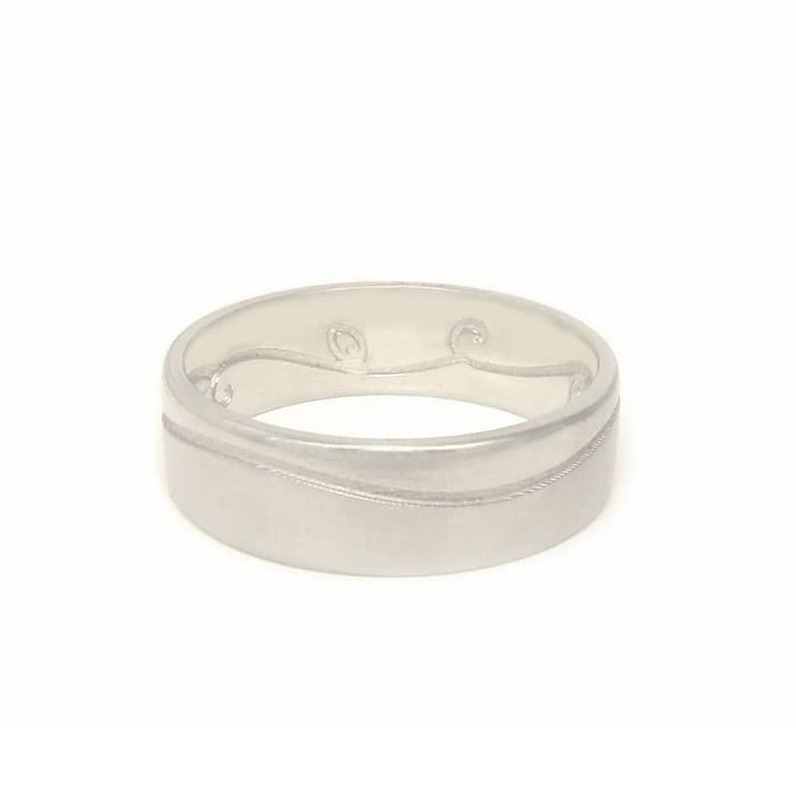 The added bonus of this is that if there is ever any concern about wearing the engagement/wedding ring set, ie: going on holiday, working in the garden etc., you can instead opt to wear the matching band alone. 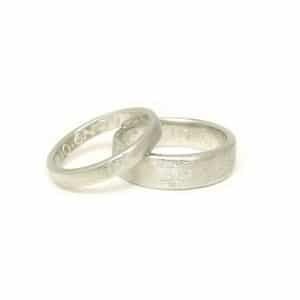 Often when people are seeking matching wedding bands they are seeking bands that will have special meaning to them. We find that couples like to symbolically incorporate special moments from their relationship into their bands. We’ve provided some of our favourites below as well as a brief description. These bands represent the idea of positive & negative – The surface of the rounded band if you turn it upside down, fits into the space created by the concave band. This set of matching bands with 3 lines symbolize the past (love you have shared), present (love you have now) and future (love you will always have). These bands are called ‘True Grit’ in part as reference to the gritty texture applied to the band and in part to symbolize the heart & resolve that also goes into a relationship. The set on the right have the added feature of the hand written GPS coordinates of where our clients first met. 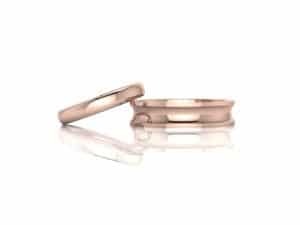 If you’d each like to go with your own wedding band design but like the idea of having them share some sort of element, we can help you there too. In the past we’ve come up with all sorts of ideas on how to have elements shared between bands yet also be completely their own. We’ve provided some images and descriptions below on these shared element bands. 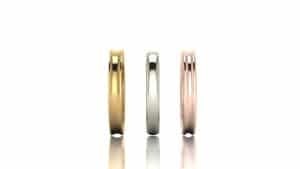 Sharing metal can be as simple as using the same metal to create both bands although the designs themselves are unique. 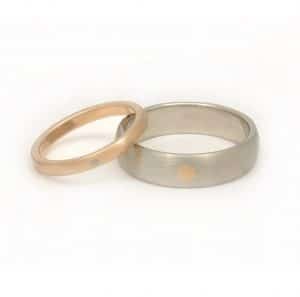 So, for example, each partner may use 14k yellow gold for their ring but the design of the ring itself is not the same such as in these rings pictured on the right. 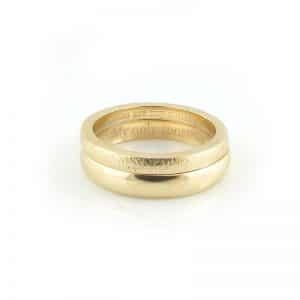 If a couple prefers different metals then we can also add a bit of each partners ring on the inside of the band. This example shows the rose gold ring with a round piece of the white gold ring soldered within it and, vice versa in the white gold band. 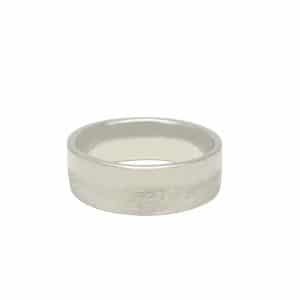 Perhaps one partner likes the idea of a texture, pattern or engraving on their band but their partner isn’t so sure. 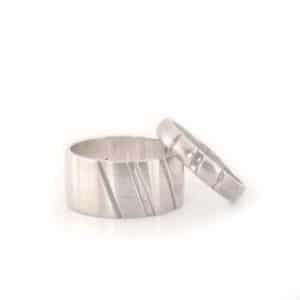 We’ve made rings in which one band has an engraving on the outside and their partner’s band has engraving on the inside such as in these examples below. 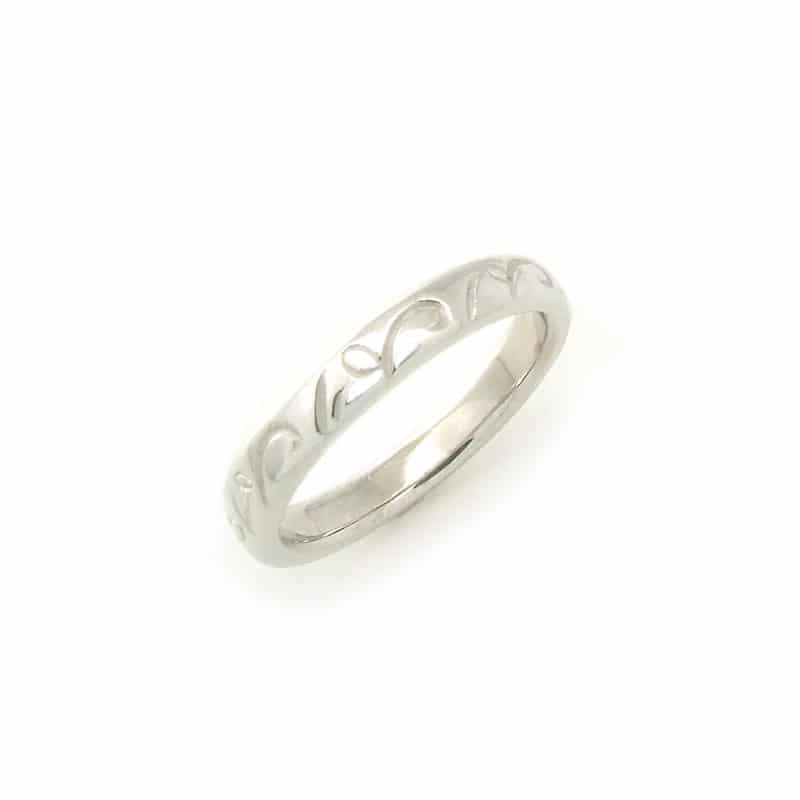 Even if you decide on wedding bands that are completely opposite in design and metal, engraved fingerprints are a wonderful personal touch that can connect the rings together. 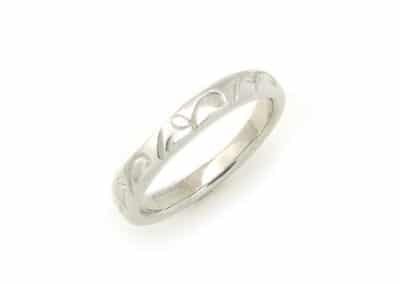 We can laser engrave fingerprints on the inside of the band after the rings are complete or even incorporate the fingerprint into the initial design. At right is an example of a ring we did incorporating the fingerprint into the initial design. Many of our clients opt to engrave their wedding bands with a special message inside. Sometimes the message is the same, as in the examples here, and sometimes they are different. Many of our clients like to come up with special, secret messages that they engrave in each other’s bands only to be revealed when they pick them up or at the wedding itself. 116 1/2 Sherbourne St., Toronto, Ontario M5A2R2, Canada (Just north of Richmond).